The CAT was designed to measure health status of COPD patients in clinical practice. It could be instantly calculated and was much shorter and easier to understand than the SGRQ, the standard assessment for COPD. Indeed, patients in a previous study reported that CAT was fairly easy, reflected well with their status, the response options, and rank systems . Our study revealed that the official Thai CAT questionnaire had an internal consistency with a Cronbach’s alpha of 0.853 and was comparable to that of the original version of CAT (Cronbach’s a coefficient of 0.88) . The validated Thai version of the SGRQ was used as an instrument to measure the validity of the official Thai CAT questionnaire. The result was significant, albeit moderate correlation supporting the validity of the official Thai CAT questionnaire (r = 0.652). 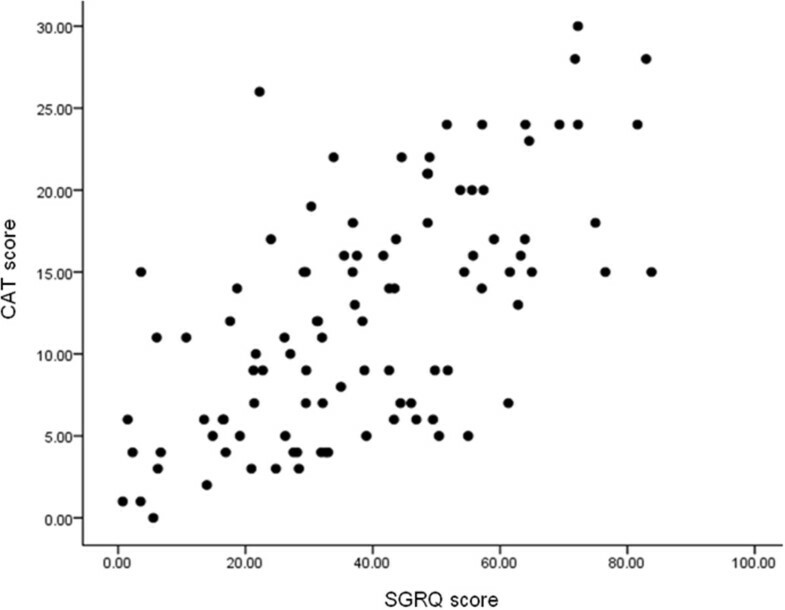 This result was similar to other findings in previous studies which varied from moderate to high correlations with assessments using the COPD-specific St. George's Respiratory Questionnaire (SGRQ-C) (r = 0.64 to 0.82) [6, 15–17]. The CAT is not a diagnostic tool but could aid in the identification of the health impairment of COPD patients. 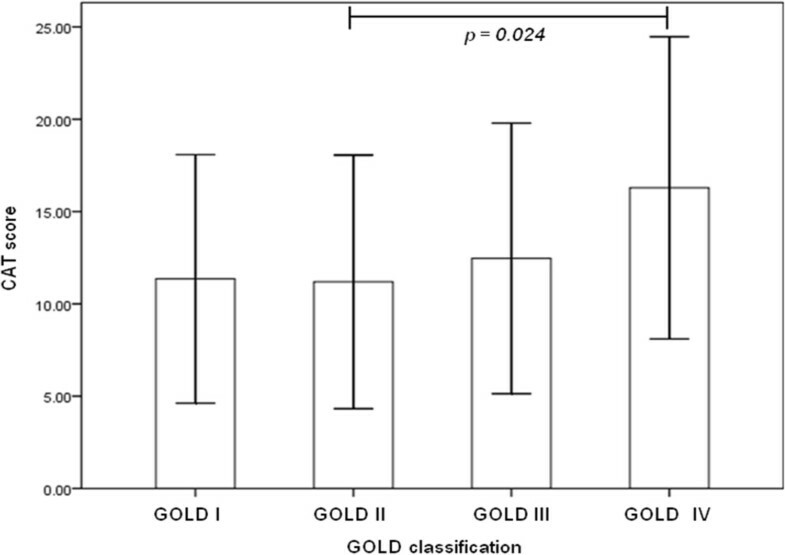 Contrary to previous reports, our study found no significant difference of mean CAT scores across different GOLD stages (except GOLD II and IV) [15, 18] which might be due to the reason that FEV1 classified by GOLD stages in this study had poorest correlation with CAT (r = −0.193). The multiple consequences of COPD have no relationship with airflow limitation and as a result, FEV1 may not reflect the total impairment caused by the disease. This was expected as the pulmonary function measured by FEV1, on which the GOLD classification of COPD stage is based, is not a good predictor of health status . MRC functional dyspnea is now proven to be useful in predicting outcomes in patients with COPD and is recommended in the routine handling and evaluation of these patients . In the present study, we had the opportunity of testing the correlation between CAT and MRC dyspnea score. It was statistically significant with moderate correlation (r = 0.550) which is similar to other studies (0.50 to 0.579) [18, 20, 21]. Currently the most widely used questionnaire for measuring health status in COPD in a research setting is the SGRQ . The main disadvantages for clinical practice are its extent as it comprises 50 questions which are viewed by the patients as rather complicated and time consuming and because scores can only be calculated using a computer-based system. On the other hand, CAT could be used as an easy and reliable tool to assess health status in COPD patients in clinical studies and might become a useful tool in routine clinical practice. Unlike the physician’s judgment of clinical severity, the CAT provides a standardized assessment and a numerical estimate of disease impact which is reported to be reliable across languages and countries [6, 16–18]. However, it is only one part of the clinician’s toolkit, to be used alongside spirometry, exacerbation history, and an assessment of co-morbidity. Its role is to supplement information obtained from lung function measurements and assessment of exacerbation risks. Like other clinical assessment techniques, its utility will only become fully apparent with time. This study provides the evidence that the official Thai CAT questionnaire is a reliable tool and is valid for providing practicing physicians a measurement of the impact of COPD on health status of their groups of patients. We need further studies to demonstrate its ability to reliably measure intra-individual change, detect interpretable differences to norms, and trigger or support useful discussion between patients and physicians which would contribute to better and more efficient care. Our study has a limitation in that it was a cross-sectional study based on a single visit; as a result repeatability estimated by calculating the intraclass correlation coefficient (ICC) was not analyzed. In addition, the validation findings were based on three sites of academic medical centers chosen on the basis of representing large referral centers for COPD patients: one site from northern part and two sites from central part of Thailand. Thus, the data might not be reliably extrapolated to all COPD populations in Thailand. Although the official Thai CAT questionnaire showed very similar properties to the much more complex Thai version of SGRQ, with a reliability of 0.853, it could not be recommended to be used in making important decisions about individuals . However, it can be considered to use together with other clinical parameters to accurately measure the impact of COPD on patients’ health status.